Sometimes you just know when something is right. I’ve always loved horses, ever since I was a kid. 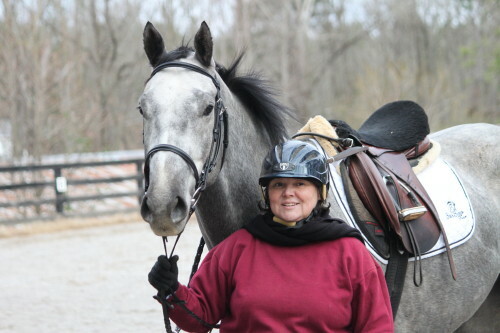 I was lucky enough to have had my own horse, as did my sister, when we were growing up in Connecticut. But when my sister got married, and I went off to college, the horses were sold, and although I often thought about getting a horse again, I just never seemed to be in the right place or to have the time or the money to do it. Even after I moved here to the Atlanta area, where there were plenty of stables, I worked too many hours and I worked downtown, and . . . well, again there was always a reason not to have a horse. But I missed it. I truly missed it. I made my husband take me to guest ranches out West on vacation – which was expensive, and only made me miss having my own horse even more. A week or 10 days in the saddle just wasn’t enough. So I started looking around for lessons. I can afford lessons, I told myself, even if I can’t afford a horse. Unfortunately, I kept finding those “Princess Stables” where they only want to teach well-heeled kids to ride expensive horses. I’m over 50. I’m not up for riding with a bunch of kids any more. And when I looked at the price of horses for sale, I pretty much gave up on the idea of having one of my own again. Then I came across the Bits & Bytes web site, and all of a sudden all those excuses for not having a horse of my own started to grow fuzzy around the edges. 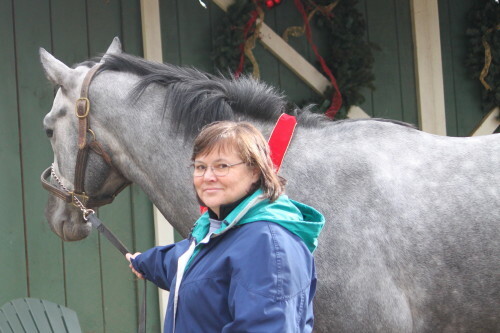 I found the site on a Friday, talked to Elizabeth the same day, came to see the stables on Sunday evening, and by Tuesday of the following week I was the owner of a 3-year old gelding named Monarch’s Reign. There wasn’t one moment of doubt in my mind that this was the right thing to do. There wasn’t one moment of doubt in my mind that this was the right thing to do. Usually, I’m not good at spending money or making any kind of “big” decision, but this was as easy as falling off a log (or a horse!) I met Elizabeth and Barry, I saw pictures of Monarch, and I bought him. Yes, I bought a “Prospect Horse”, one that I’d never ridden, and that I’d only seen photos of. And he has not disappointed me one bit. He is a beautiful, intelligent, and doesn’t act at all like I expected a “race horse” to act. In fact, the first time we turned him loose in the arena to run around, we had to chase him to get him moving! All he wanted to do was come to us to be petted and talked to. He wasn’t even afraid of the lunge whip. He is going to make a wonderful pleasure horse, and I can’t wait to start training him. No disappointment in this "mail-order groom". So what’s it like buying a prospect horse? Well, when I told one of my colleagues at work that I had purchased a retiring race horse that I’d never seen “up close and personal” and had never ridden, my co-worker joked that it sounded like I was ordering a mail-order bride. “And you know they never look like the pictures,” he warned me. But I never worried that I was going to be disappointed. There was no sense of dread, no fear that my money had been wasted and I wasn’t going to get what I thought I’d bargained for. 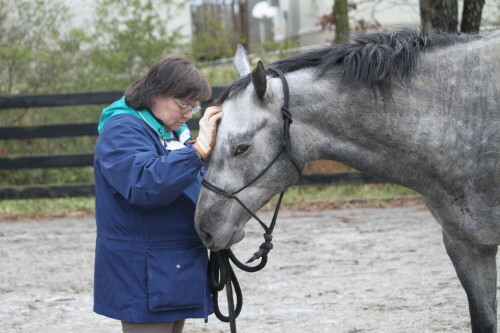 For one thing, I was working with two of the best in the business, when it comes to placing OTTBs – Barry Zuber and Elizabeth Wood. Because they truly care about the horses, and aren’t just interested in “flipping” horses to make money, I knew they would find me a horse that was right for me. 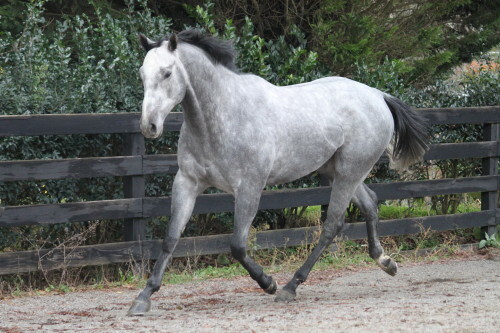 Buying a prospect horse off the track actually turned out to be BETTER than buying a horse in the “usual” way, through the want ads and checking out horses on my own. That’s in large part because I was working with experts who were working with a network of trainers and owners they know and trust. And, perhaps even more important, Elizabeth wants every new partnership between horse and owner to be a happy and productive one, so she works very hard to make sure the match is right. So is Monarch’s Reign everything I expected? Oh, yeah, and then some! When I’m with him, I can’t stop smiling. He’s gentle, he’s sweet, and he’s very smart. This is absolutely the best thing I have ever done for myself. As I said, sometimes you just know when something is right, and this was the right thing to do.